This page contains a guide on how to beat The Broodals in Super Mario Odyssey. This guide provide details on how to beat each Broodal in the game. 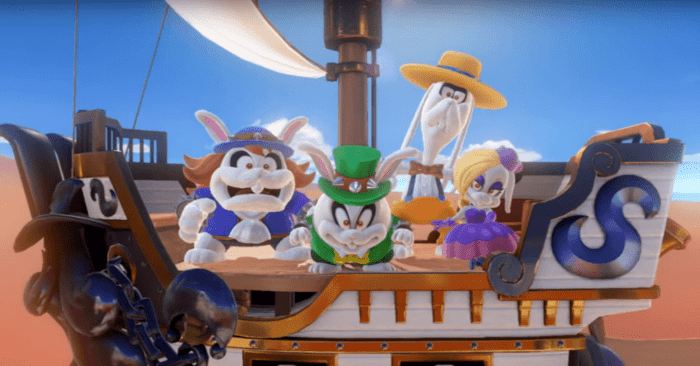 The Broodals are a group of four villainous rabbits in Super Mario Odyssey. They serve as the secondary antagonists in the game, as they are hired by Bowser to plan the wedding between him and Princess Peach. The group consists of Harriet, Topper, Madame Brood, and two other unnamed Broodals. Topper is initially fought in the Cap Kingdom, which is appropriate since he uses hats as primary weapons. He is the first Broodal that Mario fights in the game.He is a stumpy white rabbit wearing a green suit with a yellow ribbon. He is also wearing a top hat with spikes around the middle part of the hat. Click here to go to our in-depth strategy guide on how to beat Topper. This boss is an obese female white rabbit with bluish hair and wears a burgundy dress and hat, She is also accompanied by her pet, Chain Chompilkins, a Chain Chomp variant that is golden and wears a hat similar to her owner. Madame Brood also seems to be wearing a few Power Moons attached to her big necklace. Click here to go to our in-depth strategy guide on how to beat Madame Brood. Harriet is first fought in the Sand Kingdom. She is a slender white rabbit wearing a purple dress and a small purple hat. Once you fight her, she is wearing a protective metal helmet with spikes around the top. Click here to go to our in-depth strategy guide on how to beat Harriet. Mario’s first encounter with Rango is at Water Plaza Terrace in Lake Kingdom. Serving as the Broodals’ bouncer, Rango is a tall, white rabbit who wears orange suspenders and a red bow tie. The key to defeating Rango is neutralizing his hat. Click here for more details on how to defeat him. Spewart is a stocky, wild-haired Broodal who is adorned in a blue school boy outfit. He is found in the Wooded Kingdom, where he fights by spreading poison and barreling around in his giant hat. Mario needs to use Cappy liberally just to get in a shot at Spewart; click here to find out how.